The Latin Life of Saint Christopher derives ultimately from apocryphal accounts of the adventures of the apostles Andres and Bartholomew, who in their wanderings in Parthia come across a dog-headed cannibal . . . The creature, who calls himself Abominable, is struck with a profound desire to become a Christian, and does so, being renamed Christianus by Andrew, and acting as their guide in their subsequent adventures. 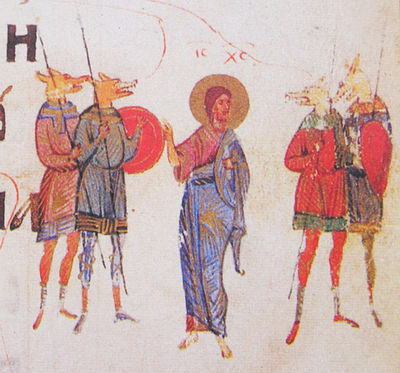 In some of these legends, the dog-headed person is rewarded with a human appearance upon baptism. Wikipedia has an excellent article on the various cultural manifestations of cynocephaly here. Thanks Highly. I don't take trackbacks either, since a recent spam invasion. Usually I find out who has linked my posts by checking Technorati every now and then.